Instead of taking the moral high ground and laughing James Cameron's comments off, the producer of Piranha 3D is responding in kind. James Cameron just can't stay out of the news this week. First, there was Blizzard saying that it'd be willing to let him direct a StarCraft movie. Then there was the interview with Vanity Fair where Cameron proceeded to rant against Piranha 3D because it had the audacity to have been filmed in 3D. Now, the executive producer of Piranha 3D has lashed out against the man who directed Avatar for his aforementioned hostility. Yesterday, Mark Canton released a surprisingly lengthy response to Cameron's bashing of Piranha 3D. In his open letter, Canton makes a point of mentioning (amongst other things) how Cameron was fired from Piranha 2, complains about how Cameron name-dropped Tim Burton (even though Canton himself does the exact same thing), states that Cameron did not invent 3D technology, and then invites Cameron to go see Piranha 3D in theaters with an audience. Canton isn't exactly a slouch in the movie business. While he's clearly not as successful as Mr. Cameron (though, let's be honest, no one really is), his credits as executive producer include films like The Spiderwick Chronicles, 300, and Land of the Dead. Of course, Canton was also the producer of Jack Frost which was so bad that it sits firmly in the same league as Titanic 2. As a producer in the entertainment industry, Jim Cameron's comments on VanityFair.com are very disappointing to me and the team that made Piranha 3D. Mr. Cameron, who singles himself out to be a visionary of movie-making, seems to have a small vision regarding any motion pictures that are not his own. It is amazing that in the movie-making process - which is certainly a team sport - that Cameron consistently celebrates himself out as though he is a team of one. His comments are ridiculous, self-serving and insulting to those of us who are not caught up in serving his ego and his rhetoric. Jim, are you kidding or what? First of all, let's start by you accepting the fact that you were the original director of Piranha 2 and you were fired. Shame on you for thinking that genre movies and the real maestros like Roger Corman and his collaborators are any less auteur or impactful in the history of cinema than you. Martin Scorcese made Boxcar Bertha at the beginning of his career. And Francis Ford Coppola made Dimentia 13 back in 1963. And those are just a few examples of the talented and successful filmmakers whose roots are in genre films. Who are you to impugn any genre film or its creators? Having been deeply involved, as either an executive or as a producer, on Tim Burton's original Batman and the first Men In Black, as well as 300, and now Immortals, one of the things that has been consistent about all of the filmmakers involved in these landscape-changing global films is that, in each and every case, all of the directors were humbled by their predecessors, their colleagues and by their awareness of the great history of film that came before them. The enjoyment and the immersion of an audience in a movie theatre, as they had and will have with the above-mentioned films, and as audiences are experiencing with Piranha 3D now, comes from the originality and the vision of the filmmaker, and not just from the creation of the technology. You as much as anyone certainly knows that there are many pieces to the puzzle. Going to the movies still remains, arguably, amongst the best communal experiences that human beings can share. My sense is that Mr. Cameron has never seen Piranha 3D ... certainly not in a movie theatre with a real audience. Jim, we invite you to take that opportunity and experience the movie in a theatre full of fans - fans for whom this movie was always intended to entertain. Does Mr. Cameron have no idea of the painstaking efforts made by the talented young filmmaker Alex Aja and his team of collaborators? Clearly, and this one is a good bet, he has no clue as to how great and how much of a fun-filled experience the audiences who have seen the film in 3D have enjoyed. Those of us who have tried to stay in touch with the common movie audiences - the ones who really matter, the ones who actually still go to the theatre, put on the glasses, and eat the popcorn - take joy and pride in the fact that movies of all kinds, including Piranha 3D, have a place in filmmaking history - past, present and future. 3D unto itself is not a genre Jim, it is a tool that gives audiences an enhanced experience as they experience all kinds of movies. I believe Mr. Cameron did not see Piranha 3D either with any real audience or not at all. On opening weekend, I was in a Los Angeles theatre with a number of today's great film makers including JJ Abrams, who actually had nothing short of the fabulous, fun 3D experience that the movie provides. I am fortunate enough to have worked on, and continue to work on, evolutionary movies in all formats from just simple good story telling, which still matters most of all, to CG movies to tent-pole size 3D movies, and genre 3D movies like Piranha 3D. What it comes down to, Jim, is - that like most things in life - size doesn't really matter. Not everyone has the advantage of having endless amounts of money to play in their sandbox and to take ten years using other people's money to make and market a film ... like you do. Why can't you just count your blessings? Why do you have to drop Marty Scorsese's or Tim Burton's names, both gentlemen who I have personally worked with, and who have enjoyed great joy and success with movies of all genres and sizes well before the advent of modern 3D? Then as now, they were like kids in a candy store recognizing, far beyond your imagination, the possibilities of storytelling and originality. For the record, before you just totally dismiss Piranha 3D and all, in your opinion, worthless genre movies that actually undoubtedly gave you the ability to start your career, you should know that Piranha 3D had an 82% "fresh" (positive) ratting on Rotten Tomatoes on opening day - a web site that all the studios, filmmakers and the public use as a barometer of what makes a quality film. We know that Piranha 3D has not achieved a boxoffice that is on the level of many of Mr. Cameron's successes. 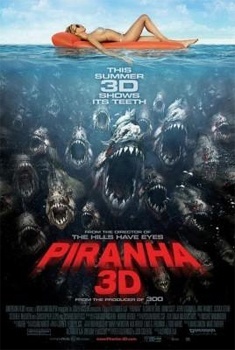 To date, Piranha 3D has earned over $30 million around the globe with #1 openings in several countries. And, as the "fresh" rating on Rotten Tomatoes indicates, critics and many, many others have embraced and celebrated Piranha 3D for the fun and entertaining - and even smart - movie-going experience that it is. Let's just keep this in mind Jim ... you did not invent 3D. You were fortunate that others inspired you to take it further. The simple truth is that I had nothing but good things to say about Avatar and my own experience since I actually saw it and didn't damn someone else's talent publicly in order to disassociate myself from my origins in the business from which we are all very fortunate. To be honest, I found the 3D in Avatar to be inconsistent and while ground breaking in many respects, sometimes I thought it overwhelmed the storytelling. Technology aside, I wish Avatar had been more original in its storytelling. We have to inspire, teach and mentor this next generation of filmmakers. It is garbage to suggest that any film or any filmmaker who cannot afford to work to your standards should be dissuaded from following his or her craft by not making 3D movies or not making movies like District 9, for example, which probably cost the amount of Avatar's craft services budget, but totally rocked it in the movie theatre and in the marketplace. In that case, it was not a 3D movie. But had it been, it certainly would not have been any less original or impactful. The enormous worldwide success of Avatar has been good in all respects for you, your financiers, your distributors and the industry, as well as for the movie going public. Jim, there is a difference between Maestro which is a word that garners respect, and Dictator or Critic which are words better left for others who are not in our mutual boat or on our team. You are one of the best, it is reasonable to think that you should dig deeper and behave like it. Young directors should be inspired by you, not publicly castigated by your mean-spirited and flawed analysis. While we are all awed by your talents and your box office successes - and I compliment you on all of them - why don't you rethink how you address films with which you are not involved? You should be taking the high road that is being travelled by so many of your peers, and pulling with them to ensure that we, as an industry, will have a continuum of talented filmmakers that will deliver a myriad of motion pictures both big and small, with 3D or any other technologies yet to come that will entertain audiences throughout the world. That is the challenge that we face. That is the future that we should deliver. Please go see Piranha in a theater near you.